The month of December is a favorite month for Filipinos, whether living overseas or in the motherland because the Philippines is known to have the world’s longest Christmas tradition. Soon as the month of September comes in Filipinos all over the world enter a Christmas mode that is of a very personal nature characterized by, renewal of bonds, thanksgiving and especially a reconnection with the country of our origin, the Philippines. However it was difficult to get in the spirit of the season because barely 3 weeks ago, my son Matthew and I just returned to Manila via an 800km overland trip from devastated Tacloban. We felt a certain high from the overland adventure mission, but on the other side, a shallow accomplishment because of the widespread images of ruin and death flashed in and out of our psyche contrasting with the thoughts of a traditional Philippine Christmas. 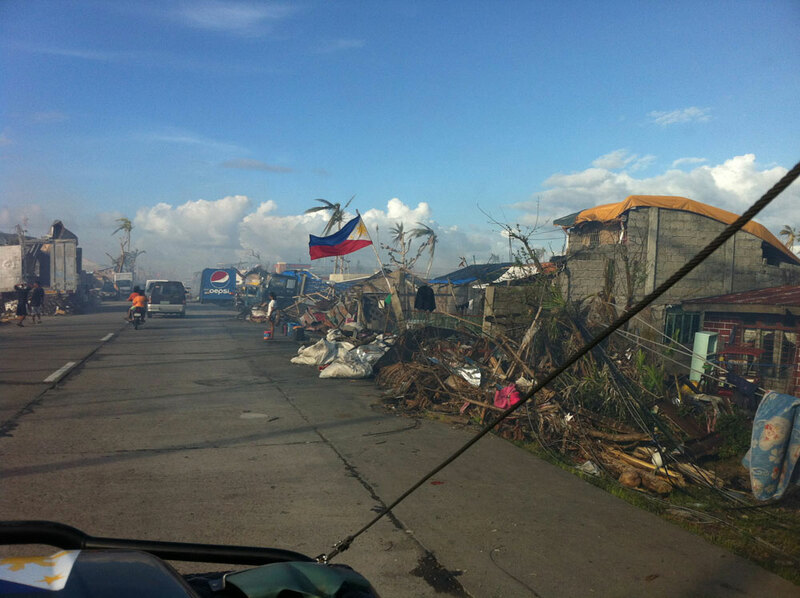 November 8, 2013, the world witnessed Tropical Cyclone Haiyan, code name Typhoon Yolanda in the Philippines, the strongest storm recorded at landfall and possibly the strongest typhoon ever recorded in terms of wind speed with as much as 315kph of one minute sustained speed slammed the middle part of the Philippine archipelago. Several islands and quaint seaside towns were totally flattened. 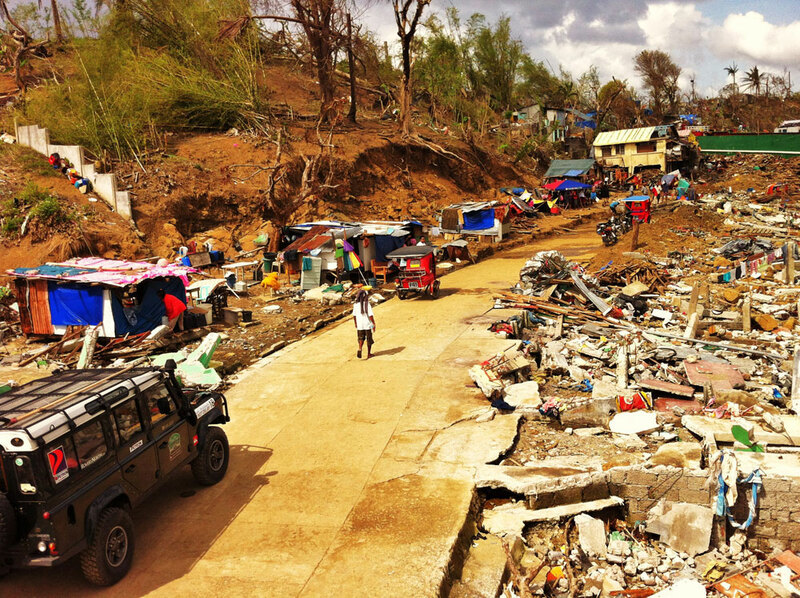 Among the severely devastated was the City of Tacloban in the province of Leyte. Tacloban is a highly urbanized city and one of the largest in the Philippines’ middle group of islands called the Visayas Islands. The extreme wind speeds coupled with heavy rain and little known then “storm surge” combined to wipe out entire bustling seaside communities of the city, claiming thousands dead and missing. Palo beach, a seaside district of the city of Tacloban served also as the landing beach of General Douglas MacArthur’s massive American military sea, air and land operation to liberate the Philippines in the later part of World War II. A large scale sculpture of the exact, now classic photo of General Mac Arthur stands as a memorial in Palo which shows the General and his staff wading through knee high sea water on Red Beach with the US Marines landing craft behind them and walking all the way inland. It is a symbolic audacity of an American Military General landing on enemy occupied territory to fulfill a promise to the Filipino people, his famous “I Shall Return”. 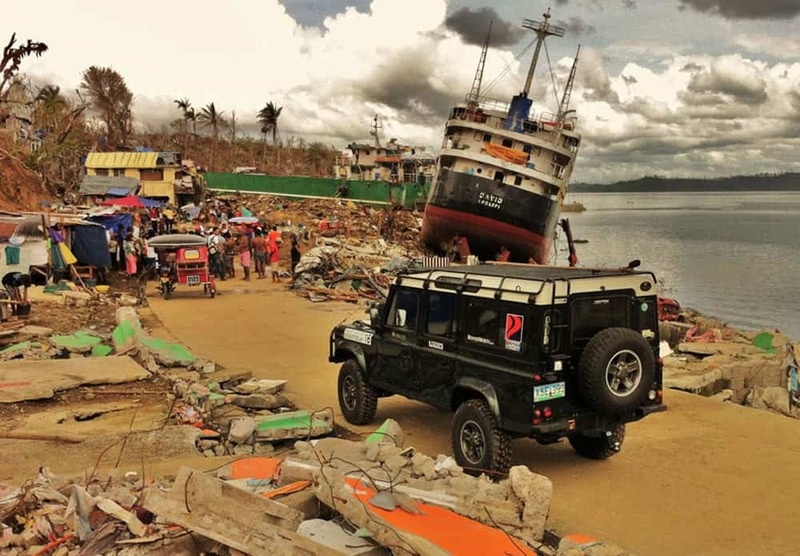 Immediately after Haiyan left, The Land Rover Club of the Philippines and it’s Relief Operations arm, Emergency Reaction Team swung into action. 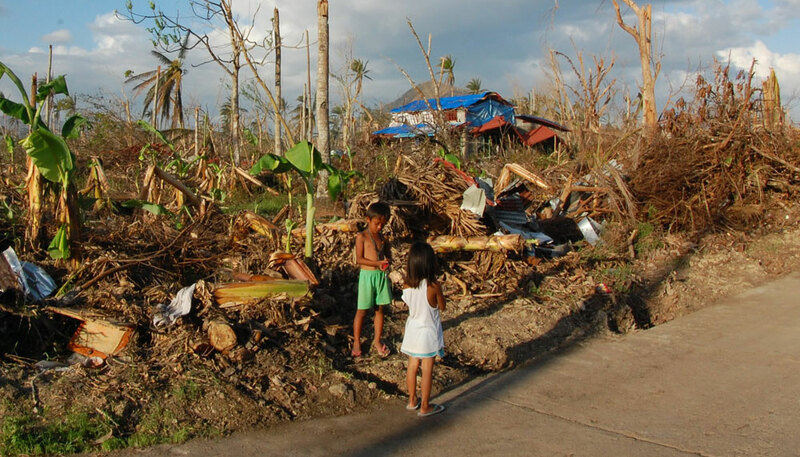 Ground assessment and feedback from the club’s own intrepid man on the ground Joe Green amazingly arrived in Tacloban by boat a day after the massive total destruction. He instantly gave bits of news to the group through any mode he can find in the chaotic first few days after the disaster. 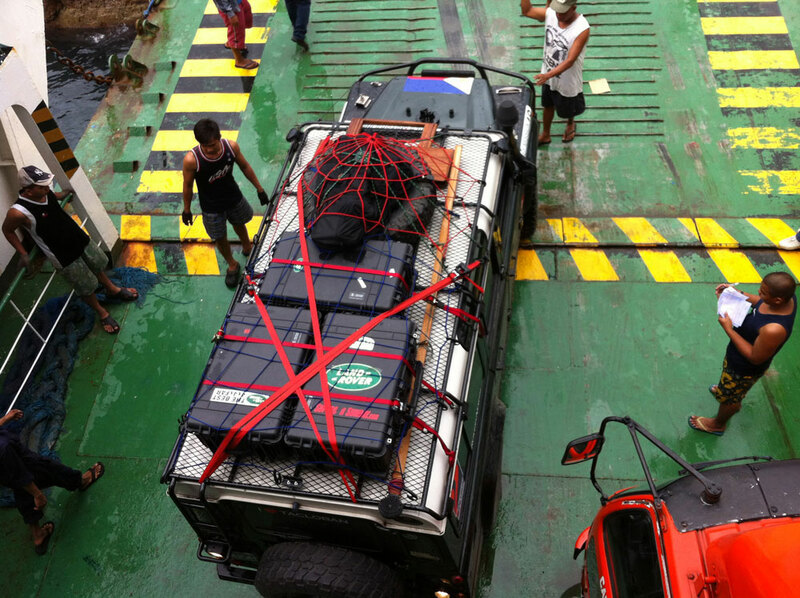 A volunteer group of Rover owners was quickly put together and sent to Tacloban. 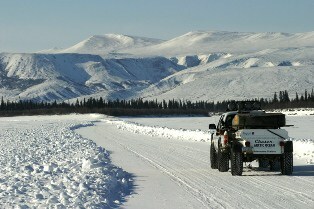 We were in the second group to arrive in our trusty Land Rovers. I remember well my conversation with Robby Consunji the club’s tireless leader, over the phone the night before deployment; he stressed that we be fully self- sufficient for 7 days including petrol, drinking water food, tools, air source to inflate tires and spares. Fortunately having come from stateside we had most of what we needed. It was exciting in a way because this would be our first and longest multi day serious overland trip in our 2002 300TDI Defender 110 SW. Also it would be our very first time to drive through the various provinces, towns, cities and of course great beaches that lined the 800km route. 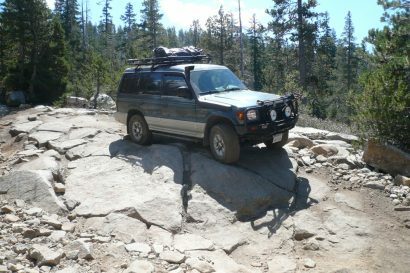 My sons and I have experience in various 4×4 overland camping trips to Colorado, Utah and all over California and we knew how and what to prepare. We brought everything except our cold weather stuff since we are now in a tropical country. 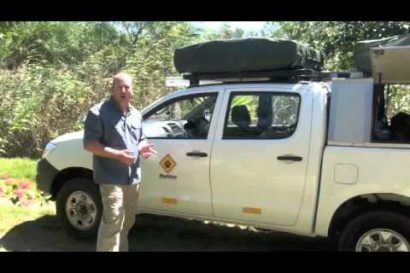 Our 2 year old, custom non-rail roof rack on the D110 would be put to the ultimate test. 3 Pelican 1650 cases packed with camping gear like, tents, air mattress, sleeping pads and cooking gear went on the roof rack, ratchet strapped and nylon stretch netting on top. In the back of the D110 we had 4 diesel jerry cans, 2 water cans, ARB fridge, various non-perishables, clothes, first aid and boots. Preparation work on the D110 consisted of topping all fluids in the transmission, transfer case, and differentials. Fresh oil went in the engine and swivel pins. The front wheel bearings were replaced. Fortunately, we had just switched to Matt Peterson’s Rockware rear shock hoops/cones and installed a set of extra big body long travel adjustable Rancho XLs shock absorbers. We opted for carry 2 spare tires; one on the bonnet and one on the rear door. We were always extremely happy with our decade old big Xenon Hellas but after one blew a bulb a week before the trip we removed it and installed in its place a 12 inch LED bar. The LED was horribly insufficient for distance illumination for the spirited but safe driving we do at night. When all 4 jerry cans were filled the rear sat lower than the front. The D110 performed perfect because we always use genuine Land Rover parts from Roversnorth of Westford Vermont USA so we were not worried too much about anything going wrong. On the return trip we had to move the bonnet spare tire on the roof to get rid of an annoying loud knocking sound whenever we went through pot holes at speed. We brought a working 2nd battery and a charger. It stayed with the genset for starting duty for a couple of days at the pension house converted into base camp for our group. Joe Green the LRCP man on the ground found this lightly damaged but intact pension house to serve as base camp for the volunteer group. This was a luxury compared to living in tents for several days. The place had a generator set, upstairs rooms and large dining room and kitchen facilities. We were able to store all our gear on the sides of the dining room. Our cans of diesel fuel were lined up near the genset for refilling each day. We set put up our tent and mattress inside the room. We slept like babies inside the tent, mosquito free and at times in the comfort of air conditioning. Not bad at all! Our first full day mission work was with an Oxfam team going to the inner communities in Tacloban. Oxfam is Oxford Committee on Famine Relief a worldwide organization based in the UK involved in various types of relief work when natural calamities strike anywhere in the globe. The particular Oxfam team we were with for the day was involved in providing water bladders, latrines; work for food programs, emergency food and shelter for a seaside community. 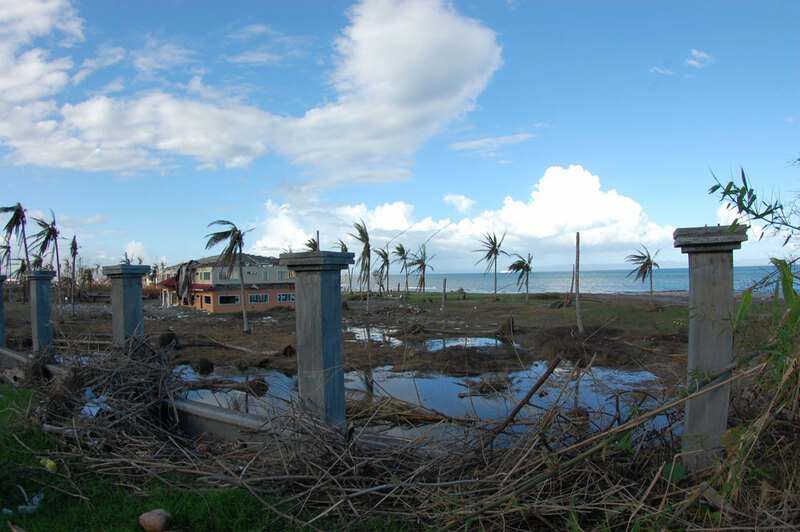 This particular community was wiped out when 3 gigantic ships were tossed around by the 300kph winds and storm surge and slammed it to this poor but bustling community on the shores just north of downtown. This was the image flashed into home television sets worldwide. But what stood out most to me was this ship spared a small barangay, community office room with 50 screaming, crying and praying people who took refuge in the upper floor concrete room. It was an amazing tale of survival. This single room two floor office building survived but all structures around them was completely flattened to the ground. The next 2 days we were assigned with the international medical doctors and nurses stationed at the RT Romualdez Hospital. We were one of 3 vehicles that transported the American, Canadian, Spanish, and Swedish medical teams to remote communities to diagnose illness, prescribe medicines or to take those seriously ill to the hospital. On our last day my son and I served as translators between the townsfolk and the Swedish medical team. We decided to drive straight all the way through back to Manila since there we 2 of us driving. Samar is a beautiful big island. I find it similar to the eastern side of the island of Maui. The roads were good and the towns were bustling with commerce. The scenery was picture perfect with frequent good views of the seaside even as we drove up hills and valleys. We drove through the world famous Mayon volcano and it was a majestic sight. There are many more places to see and explore and we would definitely be back. We hope to return to Tacloban someday and looking forward to see the resiliency of the Filipino people get the city thriving again. Please keep the people of the Visayas region of the Philippines in your thoughts and prayers specially in this Holiday Season.